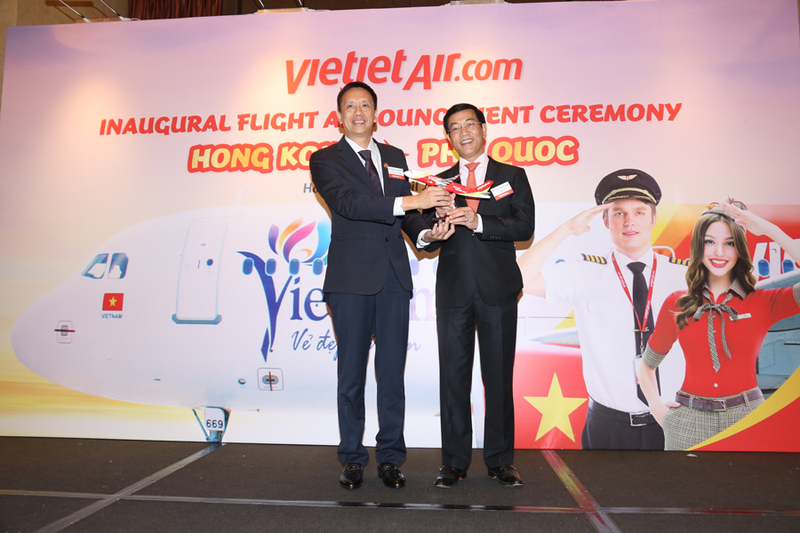 Hong Kong, China, 2019-Apr-11 — /Travel PR News/ — Today (April 09, 2019) in Hong Kong, Vietjet announced the commercial launch of a new route linking Phu Quoc and Hong Kong – one of the most well-known destinations in Asia and its operation plan for the Hong Kong market. Attending the announcement in Hong Kong were Vietnam’s Consul General in Hong Kong, Mr. Tran Thanh Huan, Deputy Director – General of Civil Aviation Authority in Hong Kong, Captain Victor Liu, Vietjet Managing Director Luu Duc Khanh, Vietjet Vice President Nguyen Thanh Son as well as various representatives of authorities and travel agents from both Vietnam and Hong Kong. The Phu Quoc – Hong Kong route will operate return flights with a frequency of four flights per week, starting from April 19, 2019. With a flight time of 2 hours and 45 minutes per leg, the flight will depart Phu Quoc at 10:50 in the morning and land in Hong Kong at 14:35; the return flight will depart from Hong Kong at 15:40 and arrive in Phu Quoc at 17:25 (all local times). The new route’s tickets are now available via website www.vietjetair.com. Hong Kong is known as one of the world’s leading centers of finance and commerce, and as a hub for numerous major corporations with headquarters in the Asia-Pacific region. With a blend of Western and Eastern cultures, a vast variety of cuisines, and a developed entertainment industry, Hong Kong is the most loved destination for tourism and shopping for many travellers. This entry was posted in Airlines, Airports, Business, Flights, Travel, Travel Management, Travel Services, Travelers and tagged flights, hong kong, Luu Duc Khanh, Nguyen Thanh Son, Phu Quoc, Tran Thanh Huan, Victor Liu, Vietjet. Bookmark the permalink.